After working for the University of Nebraska-Lincoln Unions for 39 years - not including an additional three years as a student - Union Director Daryl Swanson is retiring on June 30. Swanson counts the construction of the East Union, the creation of the Culture Center and the protection of University Childcare as his top accomplishments at UNL. 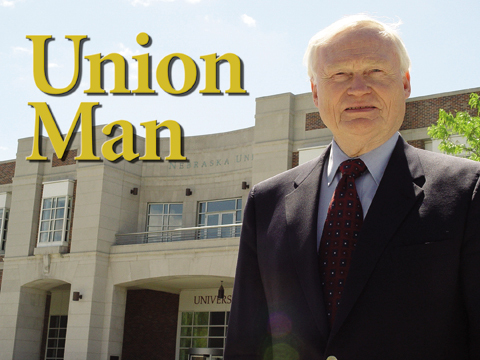 A retirement reception for Swanson will be held from 3 p.m. to 5 p.m. July 1 in the Nebraska Union. All faculty, staff and students are welcome. Photo by Troy Fedderson, University Communications. In the early morning chill of Jan. 17, 1977, Daryl Swanson cleared snow covered sidewalks and unlocked UNL's East Union doors for the first day of business. The Sheldon Memorial Art Gallery and Sculpture Garden at UNL has received a $1 million gift commitment from the Ethel S. Abbott Charitable Foundation in Lincoln. The gift is the first major contribution of its kind for support of the gallery's exhibitions and programs. A piece of forgotten UNL history is rising to the forefront this summer. It's amazing what imbibing with a colleague can do for a career. In the case of Jim Van Etten, professor of plant pathology at UNL, it got him inducted into the National Academy of Sciences. A new University of Nebraska computer program will help farmers make better-informed cropping decisions under limited water supplies. Teachers College at the University of Nebraska opened in 1908 in the basement of the Temple Building. In 1910, "Temple High" or "Teachers College High" started as a four-year secondary school. The UNL School of Music has announced the hiring of the Chiara String Quartet as artists-in-residence for a three-year stint, beginning in August. Chiara [key-ARE-uh] is an Italian word, meaning clear, pure, or light. Exhibitions featuring the work of two Great Plains artists opened June 3 and runs through July 31 at the Great Plains Art Museum, 1155 Q St., Hewit Place. Pulitzer Prize-winning poets Stephen Dunn and Ted Kooser, the U.S. poet laureate, will kick off the Nebraska Summer Writers' Conference June 20 by reading from their work from 7-8:30 p.m. at the Sheldon Memorial Art Gallery. The reading is free and open to the public. The 38th season of the Nebraska Repertory Theatre, titled "A Season of Journeys," will feature two main stage comedies and a musical for the entire family this summer. A quilt exhibition featuring political and patriotic themes is on view at the Robert Hillestad Textile Gallery through Aug. 31. The University Program Council at UNL presents the Fountain Frolics summer music series Thursdays in June and July (except June 30) on the Nebraska Union Plaza. The first feature film to emerge from Iraq after the American-led take-down of Saddam Hussein, Bhaman Ghobadi's Turtles Can Fly, opening at the Mary Riepma Ross Media Arts Center on June 10, is a profoundly moving reminder that war spares nobody - not even a child - in its wake. EDITOR'S NOTE - This is a column started by U.S. Poet Laureate and UNL professor Ted Kooser, and supported by the Poetry Foundation and the Library of Congress.